With close to 70 percent of all fruit and vegetables consumed in BC imported from California and the US, we will all have to start rethinking where our food comes from and how we grow it. Food production in California is suffering as the state goes through its fourth year of a devastating drought that climate scientists say may be the new normal. Imagining how we will produce and consume food on the island over the next 20 years is the topic of discussion at the Museum’s public forum and panel discussion at 1:30 pm, on Sunday, March 8, at the Haven’s Phoenix Auditorium. Ivan Bulic will present a short history of farming and land uses on Gabriola. The discussion will be moderated by Steve Struthers and feature a panel including Rosheen Holland, long time grower at Good Earth Farm, Brian Crumblhulme, Island Tides food columnist, Mayne Island Trustee and organic gardener; and Pollen Heath, a permaculture-based market garden farmer at Watercliff Farm here on Gabriola. Steve Struthers will also moderate “from the floor” and encourage questions and dialogue among participants, concerning all and any ideas, proposals, concerns about food production and consumption, including GMOs, the impact of climate change, agro-business, paving over agricultural land and small-scale local farming. 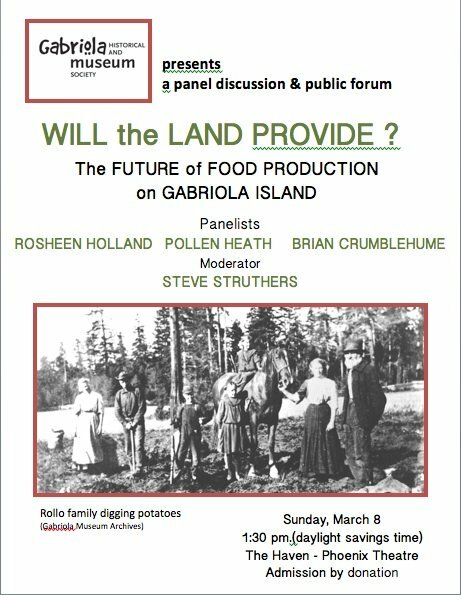 Gabriola Roots: The Land Provides will be the focus for a March 8 public forum as well as a new exhibit at the Gabriola Museum. One theme will be our island’s ongoing ability to grow its own food.